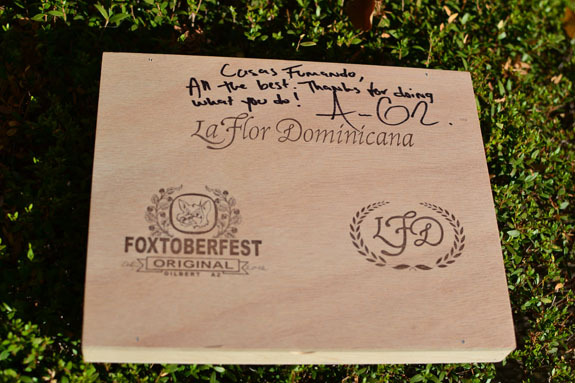 The La Flor Dominicana Foxtoberfest was one of three cigars made exclusively for Fox Cigar Bar’s 2013 Foxtoberfest, their annual cigar and beer festival. 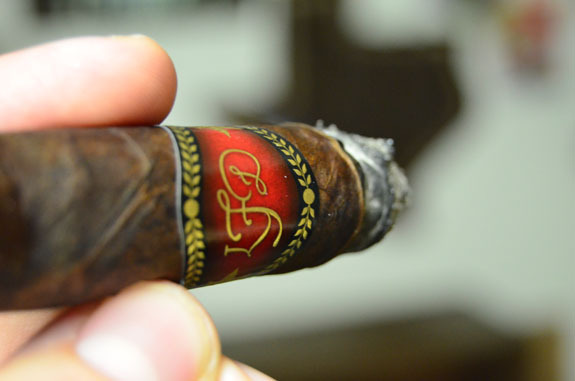 La Flor Dominicana, along with Ortega Cigar Company and Boutique Blends, stood out among the crowd of cigar companies who attended the event with their special event only releases. 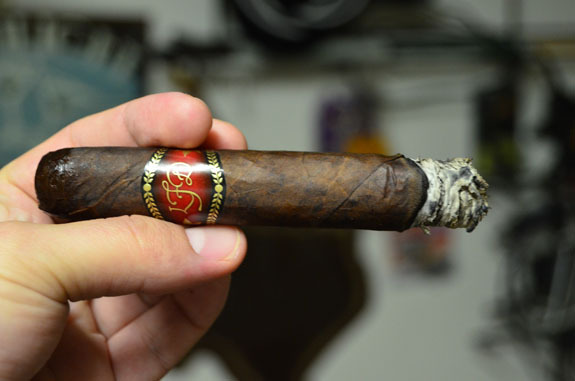 Tony reviewed Ortega Cigar Company’s Foxtoberfest exclusive here. Anthony Cantelmo shot over blend specifics, price points, batch size, and pictures of the cigar. It will be a 6.5 x 54 toro-ish vitola with a slight box press to it. The wrapper consists of a Connecticut Broadleaf wrapper around a Comeroon Binder and Dominican and Nicaraguan fillers. 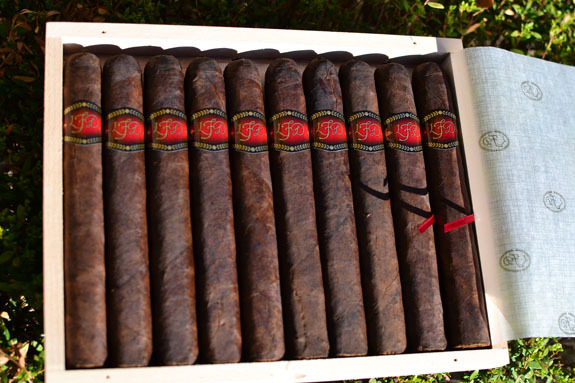 The cigars will run $8 a stick and will come 10 count boxes. Only 150 boxes will be produced and available at Foxtoberfest. 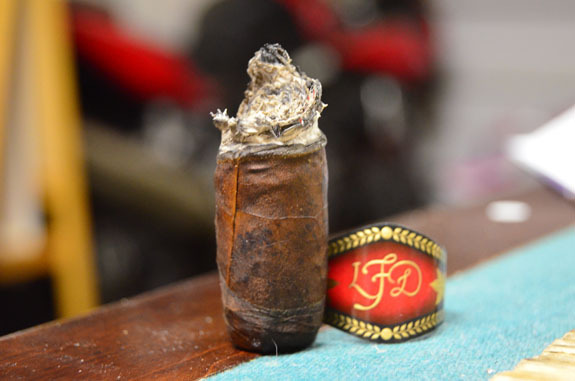 The La Flor Dominicana Foxtoberfest wears a dark brown marbleized Connecticut Broadleaf wrapper that has deep red hue. 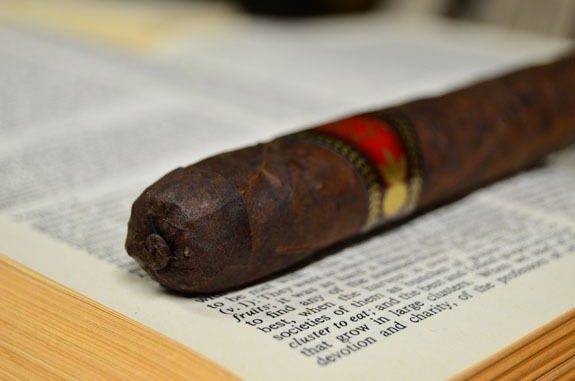 Between the veins, the bumps and color imperfections, this is one rustic looking cigar. There is one soft spot midway down the cigar and the rest of the stick gives just slightly when pressed. The aroma is faint off the wrapper with some mild vinegar and cedar. The foot gives off notes of chocolate, dark fruit, and chili powder. The small pig-tailed cap clips easily and I find a fantastic draw that is highlighting sweet chocolate, some nuttiness, and chili powder. There is no accompanying spice to the chili powder. Harsh notes of toasted/burnt bread are prevalent right at the start of the Foxtoberfest. However, within a couple minutes the profile softens with some sweetness countering an enjoyable tartness, along with some cedar, earth, and spice. The spice really stands out on the retrohale and seems to be a brighter, white pepper spice. The spice and sweetness lingers on the finish of the smoke and there is also some cocoa to be found. The burn line is thick and lopsided. I will take the blame for the lopsided burn due to rushing the toasting process. With a quick touch-up right at an inch in, the burn is back in-line and things are looking good. The ash is dark, layered, and flaky but holding past an inch. The cigar is burning incredibly slow as I am barely making my way into the second third after 50 minutes. The cedar has become a bit charred tasting, somewhat like the introductory flavor I picked up on but is not overpowering. The sweetness and tartness continue to balance out the harsher flavors. Cocoa and a savory, meatiness seem to be creeping into the profile. The spice has calmed on the retrohale and some yeasty, bread-like notes have joined the mix. The flavors have picked up from medium to full, as well as the strength. The burn line is still meandering requiring another touch-up at the end of the second third. The charred wood continues to hold its ground, and there is some additional earthiness and leather. The smoke production is just awesome right now. The smoke remains cool. The sweetness has faded or at least is being hidden by the more dominant flavors. The burn line is sloppy and I am going to see if I can make it to the end without any additional fixes. Ash flakes are dropping all over the keyboard and I am making quite the mess. While I am no leaf expert, I was able to easily distinguish the different roles the leaves played in the flavor profile. 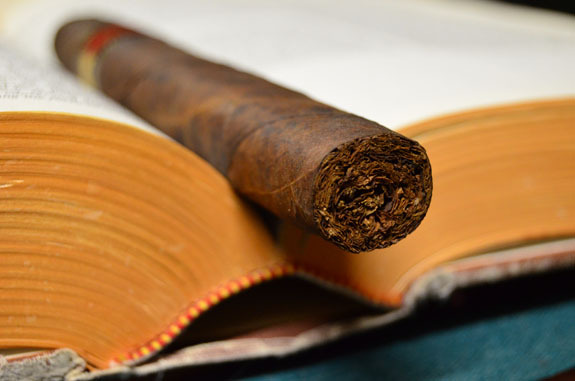 The Cameroon binder showed off a wonderful sweetness, while the Connecticut Broadleaf contrasted it with its common tartness and savory meatiness. The first and second third delivered complexity and a mostly balanced profile. 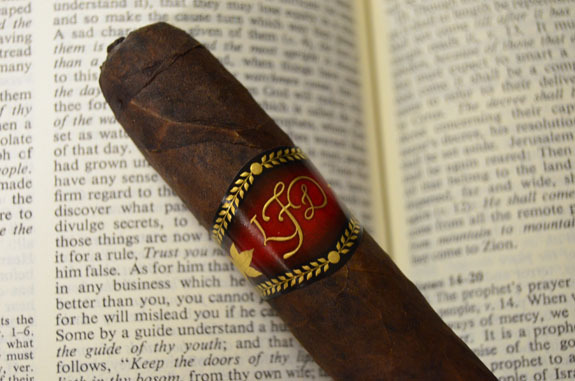 However, the cigar did not end as well as it began when charred notes arrived. I have almost a full box left so I am going to let these puppies age a bit and revisit in 6 months or so to see if the final third improves. 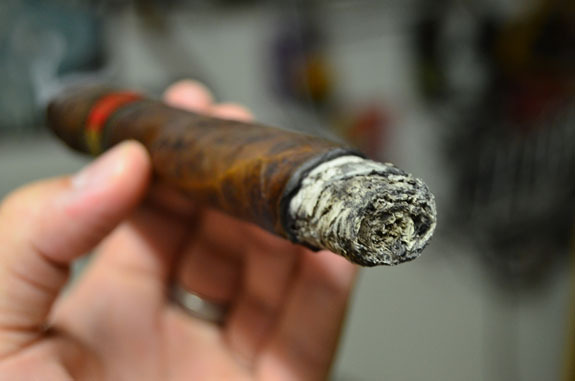 The performance did not meet my expectations with a few relights and a crazy flaky ash. Overall, this was a good cigar that offered a unique experience.